Some surfers insist that they get very sick when surfing in red-tide waters ... Although it isn't the dinoflagellates themselves that are responsible, says phytoplankton ecologist Peter Franks (Scripps Institution of Oceanography), it may be due to "red tides [decreasing] the mortality of human pathogenic bacteria that get into nearshore waters. These bacteria normally die pretty quickly, [but] they may die slower during a red tide, perhaps due to the increased amounts of organic material in the water. So perhaps [the reported illnesses and] ear infections are because of other bacteria that are present in higher concentrations in a red tide than they would normally be. (Please give us funding to pursue this.)" The credit goes to a student of his for preliminary research to this effect. Sometimes we don't even know what we have ... Gary Elliot, a regular at Swami's beach in Encinitas, took a bunch of pictures on Thursday, September 1, 2011 as a giant south swell graced Southern California with surging waves and longshore rip currents. The good news? If it was a shark, nobody was the wiser. Researcher Ralph Collier bills this one a sub-adult 3-4 meter white shark (that's 10-12 feet, not quite grown). I mentioned to Gary that it was a bit odd that no one else saw it, not even the fin poking out of the water. Was it a dolphin? "The surfacing behavior of sharks and dolphins is very different," Gary pointed out, adding that he has been a lifelong Cousteau fan and was scuba-certified at age 13. The photo has circled the world, with many ocean users comforted that a shark could be so mellow and friendly as to be sharing the waves and never be seen. The beach was left open, surfers continued to ride the waves, and landlubbers marveled at the wild picture taken in Encinitas. Gary's photo follows shark sightings elsewhere in San Diego within a single week, though several miles apart. "Sharks have always been there," ocean lovers declare. 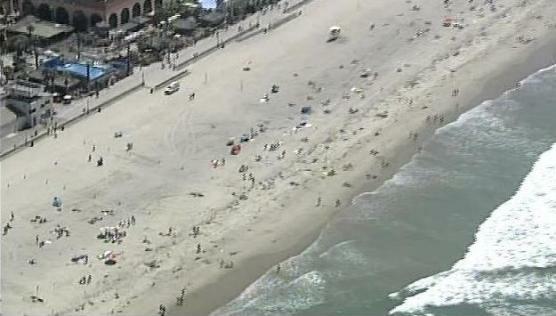 Comment (on the ridiculous) from a former lifeguard: "Mission Beach was closed because a shark swam by!" Summer came to Southern California for the months of June and July this year, took a leave of absence for the first three weeks of August (2011), and returned on Thursday, August 25th with blue skies, hot coastal days and a couple of dorsal-fin sightings at San Diego's crowded Mission Beach. Tower 15, 100 yards off shore ... middle of the day, just past noon. Lifeguard Todd Rice, all too familiar with ocean critters, was out on a rescue board (off duty, however) when he spotted a fin sticking out of the water, 18 inches high. 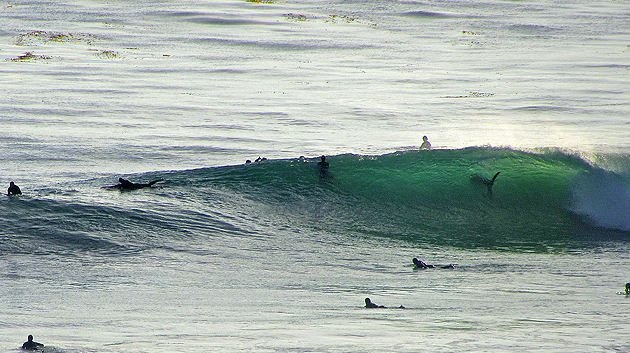 He knew what it was -- a great white, and not a small size -- and took the first wave right back in. Three hundred people were cleared from the water, some bummed because it was the last summer weekend before school started. And hot, to boot! A 2-mile stretch of beach was closed, re-opening Friday morning only to promptly close again as surfer Tom Lochtefeld saw a gray fin only 25 yards out. It was 8:45 a.m.
25 yards is scary. 100 yards isn't much more comforting. The reality is that most sharks, even if they cruise in for whatever reason, will not do anything, although most of us wouldn't take the risk. Researchers hesitate to put a number on how many whites are on the Pacific Coast, but some are willing to guess it's in the vicinity of 200 to 300. For some 1200 miles of coastline, that's not a whole lot. Let's do the math ... that's one for every 4 or 5 miles of coastline, and it doesn't mean they're patrolling the shore. Researcher Ralph Collier comments that fishermen have not seen the usual number of juveniles off their boats this spring, suggesting that not as many adults have reproduced (for whatever reason). Seal carcasses did not decorate San Diego shorelines this past winter in the numbers noticed in the past. Perhaps there are low years and higher years for white shark presence in different regions of the world ... Southern California seems to have dipped this time around.